By Allen Fox: It’s generally considered a given that WBO light welterweight champion Timothy Bradley will be next up for WBO welterweight champion Manny Pacquiao if Bradley can beat 40-year-old Joel Casamayor on November 12th in their fight on the undercard of Pacquiao vs. Juan Manuel Marquez. Pacquiao will also have to beat Marquez, but he’s got things pretty well stacked in his favor with the 38-year-old Marquez having to move up two entire divisions to take the Pacquiao fight. 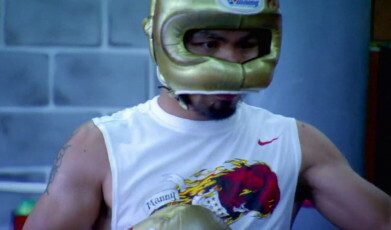 Bob Arum, the promoter for Pacquiao, is reportedly saying that Bradley may not be next in line for the Filipino star. Who then would be next is the big question if not Bradley. The only reason Arum might not want to put Bradley in with Pacquiao right now is because it’s still too soon. Bradley doesn’t have much of a base and it won’t be the huge fight that Arum would like it to be if he puts Bradley in with Pacquiao right now. Arum just signed Bradley to a contract with Top Rank and wants to make a star out of the fighter. But if Arum throws him in with Pacquiao well before he’s even come close to getting to the star level, Arum will be messing things up for himself. Bradley will get exposed by Pacquiao and it’ll take a lot longer for Arum to build him back up again, if it’s even possible. Since a fight between Pacquiao and a non-star like Bradley likely wouldn’t bring in huge pay per view numbers, Arum would be making a big mistake of putting Bradley in with Pacquiao right now. Arum is better off putting Pacquiao back in with his other Top Rank stars like Miguel Cotto and Antonio Margarito rather than letting Bradley go taken out too soon by Pacquiao. Who Pacquiao wants to fight after the Marquez fight will be up to Arum, Pacquiao and Pacquiao’s advisor Michael Koncz. There are a number of quality fighters that are ready right now to fight Pacquiao, such as Sergio Martinez, Andre Berto and Marcos Maidana. I don’t agree that Pacquiao should fight Vyacheslav Senchenko, the WBA welterweight champion. Freddie Roach recently mentioned Senchenko as someone Pacquiao could fight in the future. That’s a worthless fight because Senchenko hasn’t been marketed to the American public as of yet, and the casual boxing fans will be hearing about him for the first time if he fights Pacquiao. As for Bradley, he could really help himself a lot if he were to fight IBF/WBA light welterweight champion Amir Khan and beat him. Bradley needs to get a big win in order to make him a more appealing opponent for Pacquiao, and Bradley’s biggest wins of his career over Lamont Peterson and Devon Alexander isn’t enough. He needs at least one, possibly two big wins to get to the level where it’ll be worth it for Arum to put him in with Pacquiao. Bradley should fight Khan, Maidana and then maybe someone like Breidis Prescott or Paul McCloskey. « Will Mayweather’s future fights go for $59.95?